Heat 1 cup heavy cream with 1/4 cup sugar in a small pot. Once cream is hot (steaming) remove from heat. Add chocolate and chili powder to a mixing bowl and add the hot cream. Let sit until chocolate is melted and whisk everything together. Add the rest of the cream to bowl and stir together. Cool chocolate mixture down in refrigerator until cold. Then whisk or use a hand mixer to whip the cream and chocolate until it holds stiff peaks. Working in a baking dish or on a platter, add a small spoonful of the chocolate whipped cream to 4 crackers and lay them down on the platter. The cream will help the crackers stay in place. 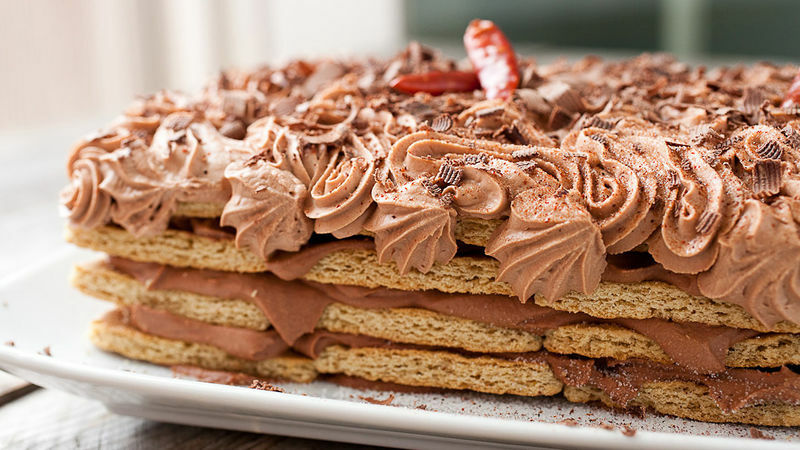 Add a layer of chocolate cream to the bottom layer of graham crackers, then add another layer of crackers. Continue layering until cake is 4 layers high. Make sure to keep about 2 cups of chocolate cream to top the cake with later. When last layer of graham crackers is on top, cover cake with plastic wrap and store in refrigerator for at least 4 hours (overnight is best). Don’t frost the top of the cake before you store it. When the cake comes out of the refrigerator, frost with the leftover cream. To bring the whipped cream back to life, you can add a little cream to it and whip it again with a mixer until it's light and fluffy. If you want to make it look nice, pipe frosting onto the cake. When the cake is frosted, stir together 1 tablespoon sugar with 1 teaspoon chili powder and dust the cake with the sugar mixture. Then shave some chocolate on top and serve chilled! Here’s the problem with summer: It’s hot and an oven only makes it hotter. But if you’re like me, you still want cake. It’s a serious summer dilemma. This cake is like a breath of fresh air during the summer. It has just a few ingredients and you don’t have to turn on the oven! The key ingredient to this cake is a simple chocolate whipped cream with just enough chili to give it a little kick. Heat about a cup of cream with 1/4 cup of sugar until it’s hot and steaming. Then pour that over the chocolate and chili and let it sit until the chocolate is melted. You should be able to stir it all together into a smooth, rich melted chocolate. Add the rest of the cream to this and chill it down in the fridge until it’s cool. Then use a whisk or hand mixer to beat the chocolate cream until it holds stiff peaks. This stuff tastes so good! When your whipped cream is ready, spread a small amount of it on four graham crackers and lay those down on a platter. The cream will help the bottom layer of the cake stay in place. Then start adding layers of cream and graham crackers until you have a cake four layers high. Be sure to save some cream for later so you can top the cake! When you add your last top layer of graham crackers, wrap the cake with plastic wrap and store it in the fridge for at least four hours. This is a really important step because it will soften up the graham crackers a bit. When they come out of the fridge, you should be able to bend the crackers a bit. You’ll want to save 1-2 cups of chocolate cream to top the cake with after it comes out of the fridge. If the cream is too hard, you can bring it back to life by whisking it with an extra few tablespoons of cream until it’s light and fluffy. You can just spread the frosting on, but I like to pipe it on. To top off the cake, just stir together some sugar and chili powder. Dust that mixture over the cake and grate some chocolate shavings on top. This is one of my new favorite summer desserts. It’s totally delicious and tastes really unique. I can’t wait to make it again! Nick thinks the best summer cake doesn’t require an oven! Check out his blog, Macheesmo, and follow him on his Tablespoon profile.